The Mining Turtle is a block added by the ComputerCraft mod. A Turtle with the ability to mine any block it encounters. The turtle requires fuel to move in the form of combustibles such as, starting with the most efficient: Lava, Coal, Charcoal or Wood. The Turtle is immune to lava and its pick is indestructible. The Turtle doesn't keep the chunk loaded, this means that the Player has to stay within the same chunk as the Turtle or use a Dimensional Anchor or Chunk Loader. Leaving the chunk or shutting down the game (or a server reboot) while a Turtle is running will cause it to forget its task. The Turtle's programming is written in Lua, an easy to learn code language, given some interest and a good resource. Turtle actions are defined by an API, a set of specific action commands to put the turtle in motion. Simple tasks may be written to make the Turtle dig a shaft, place torches and ladders, dig tunnels and bridges across lava and so much more, the possibilities of use are endless. We hope the Player will enjoy this remarkable utility companion. Have Fun! Mining Turtle has no known uses in crafting. With the label set, the name displays above the Turtle (while pointing at it) and it can be removed while retaining it's memory and fuel. 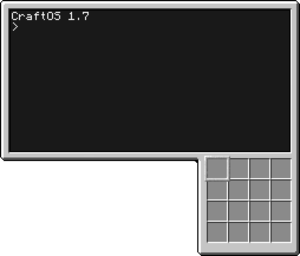 A folder  is created in the game folder, containing any files edited with the Turtle. On the right of the Players inventory is the 16 slot  Turtle inventory, where fuel, items harvested and to be placed or equipped by the Turtle are stored . At any time the Player may type: help for a list of help subjects. Adding the name of a program or command will give a summary of use. ↑ Reversing the recipe will place the pick on the right side of the Turtle where it's only slightly visible while in inventory. ↑ The Turtle folder is named with a number corresponding to the number of Turtles labelled. The typical folder path is: FTB<Modpack name>/minecraft/saves/world/computer/1. A file codded with an editor such as Notepad++ can be saved as an existing Turtle file in this folder and executed with the Turtle in-game. Once labelled the Turtle will no longer stack with other Turtles. ↑ The numbering of the slots goes from left to right, top to bottom, from 1 to 16. ↑ By default, when the Turtle runs out of fuel it will scan its inventory and use any combustible items stored or harvested as fuel. To avoid the Turtle consuming resources use the command refuel all with the fuel of choice in the Turtle's inventory to manually refuel. The Diamond Pick used in the recipe must be undamaged, furthermore, enchantment on the Pick will have no effect on the Mining Turtle. This page was last modified on 31 July 2018, at 09:42.